In the twilight of George W. Bush's presidency, the president has shown himself to be a small and unpopular leader, but a fairly good politician. A good politician is someone who knows how to get people to support him by making them believe that he agrees with them, even when the policies he advances are contrary to their wishes and interests. Bush's success in endearing himself to his supporters comes across clearly in his administration's handling of Iran. For the past four years, US military commanders have provided mountains of evidence demonstrating unequivocally that Iran is the central force behind the terror and violence in Iraq. Iran arms the forces terrorizing the Iraqi people and fighting coalition forces. Iranian Revolutionary Guards and Hizbullah forces direct and organize the insurgency. Al-Qaida operatives in Iraq receive their orders from al-Qaida leaders who have been operating in Iran since December 2001. Iran's activities in Iraq are not limited to directing the terror war. In the Kurdish areas in northern Iraq, Iran exploits its close relations with Kurdish President Masoud Barzani to undermine US-Turkish relations. On Tuesday, Michael Rubin, who serves as a fellow at the American Enterprise Institute and previously worked as an adviser to the Pentagon in Iraq, discussed this situation in testimony before the House Foreign Relations committee. Rubin testified that "Barzani has provided safe-haven and arms to PKK terrorists responsible for the deaths in Turkey of more than 100 people since January alone." Stemming from this state of affairs, in recent weeks, US-Turkish relations, and especially US relations with the anti-Islamist Turkish military, have reached an all time low. For the first time there is a distinct possibility that Turkey may withdraw from NATO. This state of affairs transpires as Turkey's Islamist Prime Minister Recip Erdogan moves to strengthen Turkey's relations with Iran and Syria. At his press conference last week, Bush spoke forthrightly about Iran's role in the Iraq war. Bush said, "The fight in Iraq is part of a broader struggle that's unfolding across the region…The same regime in Iran that is pursuing nuclear weapons and threatening to wipe Israel off the map is also providing sophisticated IEDs to extremists in Iraq who are using them to kill American soldiers." Bush also pointed his finger at Hizbullah and Syria for the central role they too play in the war. Bush's remarks were music to the ears of those who have been urging the US to confront the Iranians. But unfortunately, his statement last week, like countless statements that preceded it, was not matched by any revision of the administration's Iran policy. That policy, which the Bush administration has pressed for the past four years, is characterized by continuous and consistently escalating attempts to appease Iran's leaders. Two months ago the administration held the first US diplomatic contacts with Iranian officials since the Islamic revolution in 1979. With the declared goal of convincing the Iranians to put out the fires they are lighting in Iraq, the administration dispatched its ambassador in Iraq to meet with Iranian diplomats. Iran responded to this radical departure from traditional US policy with unbridled contempt. Iran's supreme leader Ali Khamenei taunted, ""Why don't you admit that you are weak and your razor is blunt?" Days after the meeting, the Iranians announced that they had arrested four US citizens who were in Iran visiting their relatives. This week, two sickly looking American prisoners were paraded before television cameras presumptively admitting that they had been working as US agents to subvert the Iranian regime. The administration responded to this outrage by on the one hand, expressing outrage, and on the other hand, by intensifying its efforts to mollify the mullahs by renewing direct talks between the US ambassador in Iraq and his Iranian interlocutors. The absurdity and defeatism inherent in the administration's abject refusal to change course was given full expression in the following exchange between a reporter and State Department Spokesman Sean McCormack on Tuesday. Question: Given that you have not seen… anything, [from] the first [meeting that] could be helpful. Why do you have reason to believe that another one would be any more successful than the first one if you haven't seen any change yet? Answer: Well, we'll see. That depends on the Iranians. That's going to be up to them. As I said, it could be helpful. It could be useful to be able to have that direct exchange and to convey a message, once again, directly to them. But we'll see. This is entirely dependent upon the Iranians and what they decide to do vis-a-vis Iraq. There can be little doubt that most Americans do not wish to be humiliated by Iran. And yet, due to Bush's strident anti-Iranian rhetoric, the administration has reined in criticism of its Iran policy even as that policy is causing the US to take daily Iranian attacks against its soldiers, citizens and vital interests lying down. Rather than object to this failed policy, Bush's supporters are led to believe that there must be more to what is happening than meets the eye, when in fact there isn't. It is against this background that one should approach Bush's speech Monday regarding the Palestinian conflict with Israel. In his address, as in his statements on Iran, Bush was careful to make his supporters think that he agrees with them even as he advances a policy they dislike. Bush's success in convincing his supporters that he is on their side was clearly evidenced Wednesday in a Wall Street Journal op-ed authored by Israeli historian Michael Oren. Oren's article, which the White House later distributed to Jewish leaders, upheld the address as an amplification of the Bush Doctrine. In Oren's view, "Never before has any American president placed the onus of demonstrating a commitment to peace so emphatically on Palestinian shoulders." And in fact, the president did have some strong words for the Palestinians. He said they "must match their words denouncing terror with action to combat terror. The Palestinian government must arrest terrorists, dismantle their infrastructure, and confiscate illegal weapons – as the road map requires. They must work to stop attacks on Israel, and to free the Israeli soldier held hostage by extremists. And they must enforce the law without corruption, so they can earn the trust of their people, and of the world. 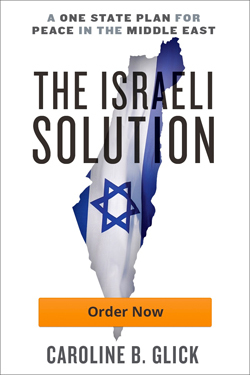 Taking these steps will enable the Palestinians to have a state of their own. And there's only way to end the conflict, and nothing less is acceptable." This strong statement led Oren to assert that Bush's speech was a clear message of support for Israel and against Palestinian terrorism. Yet the statement, and others that Oren quoted in his defense of Bush, were wholly disconnected from the actual policy that Bush is advancing and that he spelled out clearly in his address. Neither on Monday nor at any other time did Bush condition his support for the Palestinians on their taking concerted action against terrorism. Indeed, as he made clear in his speech, his policy is predicated on the basic assumption that the Palestinians must be bribed with money, American legitimacy and Israeli lands, and that Israel must be pressured to make more and more concessions to the Palestinians before one can expect them to change their terrorist policies, values and goals. Far from revisiting this assumption after Palestinian Authority Chairman Mahmoud Abbas's US-trained Fatah forces surrendered to Hamas in Gaza last month, administration officials responded to the rout by intensifying their belief in it. Take for example Bush's demand that Abbas arrest terrorists. Bush made this demand while simultaneously upholding Abbas as a peace-seeking, terror abhorring leader. Yet Abbas's one consistent demand is for Israel to release terrorists from prison and grant amnesty to terror commanders it has yet to arrest. Today the administration has made preventing a Hamas takeover of Judea and Samaria its immediate goal. Monday morning The Washington Post reported that since the Hamas takeover of Gaza, US intelligence agencies have concluded that the only thing preventing Hamas from taking over Judea and Samaria is the IDF. As one senior intelligence official put it, "Israeli military operations are the major factor restricting Hamas activity [in the areas]." Yet rather than urge Israel to maintain its counter-terror operations, Bush said that the Israelis should find "practical ways to reduce their footprint" in Judea and Samaria. He also pledged $80 million to Fatah militias whose officer corps are teeming with the same terrorists that Abbas is supposed to be arresting. Bush told the Palestinians that this is a "moment of choice" for them. It is time for them to decide if they are for terror or peace. But then, he said the same thing five years ago. Since then, at every decision point, the Palestinians chose terror. They have built terror armies and amassed terror arsenals. The have strengthened their ties to Iran, Syria, Hizbullah and al-Qaida. They overwhelmingly elected Hamas to lead them. But in the interests of advancing its policy of appeasement, the Bush administration abjectly refuses to acknowledge that the Palestinians have already chosen. Abbas is the man that Bush believes will cause the Palestinians to have a change of heart. Bush places his trust in Abbas – the man who has pocketed billions of dollars in assistance from the US, the EU and Israel but has never lifted a finger against terrorists or done anything to end the corruption endemic in his government. Bush upholds Abbas, who equipped his US-trained forces with anti-aircraft and anti-tank missiles which are completely useless for fighting terror cells but come in mighty handy for fighting Israel. Israel's assigned role in this diplomatic farce is the patsy. Due to the exigencies of democratic politics, and in the absence of leadership on either side, over the past few years, US-Israel relations have taken on a sado-masochistic quality. To endear himself with the State Department and Europe, Bush has chosen to insist that Israel endanger itself. To survive in office, Olmert, like Ariel Sharon before him, has agreed to endanger Israel in order to secure the support of the Left in his governing coalition, the media, and the State Prosecutor's office. The one conclusion that cries out from all of this is that in the waning days of the Bush administration, and perhaps of the Olmert government, the American and Israeli publics need to find ways to make it clear that they demand good leaders, not good politicians.